Today we are interviewing H.T. 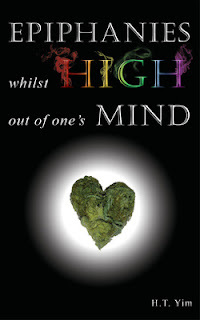 Yim about her book "Epiphanies Whilst High Out of One's Mind," as part of the book's blog tour. I’m an aspiring novelist. Three things that I can say define me, which I love and which govern my daily life, are literature (predominantly science fiction and fantasy), marijuana and feminism. It’s a work of narrative nonfiction, describing in vivid detail the evolution of an average user’s relationship with marijuana, from initial trauma and aversion to profound appreciation. It’s an intensely personal memoir, recounting a girl’s subjective experiences and development with both the substance and with love – the two of which coincided due to a consistent attraction towards potheads. It’s a humorous collection of essays written on the subject of and inspired by marijuana, peppered with practical tips and references to recent research on health and sociological effects – references which dispel certain stereotypes and which promote conscious consumption. Based on feedback thus far, it seems that veteran users find the book relatable and that non-users find it interesting, as it describes experiences they’ve never had. But the individuals I imagine benefiting the most from this book are new users: people who’ve never fully experimented with marijuana for fear of legal and social repercussions. Legalization won’t change the consumption behavior of existing users – we’ll just continue to do what we always have, only now without insensible and hypocritical laws looming over our heads – or that of non-drug users. If a person isn’t prone to taking any substances including alcohol and tobacco, they’re probably not about to start smoking pot just because its legality has changed. Legalization opens doors for people who’ve maybe tried weed or were curious about it, but for whom the risks always outweighed the benefits. But it’s also imprudent to implement legalization alone: reform has to be complemented by education. No one’s died as a direct result of cannabis, but overconsumption is traumatizing to experience – depending on the form and method, exceeding tolerance can entail hours of intense paranoia and helplessness. I wish someone had warned me of the different effects of ingesting marijuana or of combining it with alcohol, or of the effects on REM sleep and working memory. Hopefully, Epiphanies will help impart such lessons on new users. What are some of the biggest misconceptions regarding recreational marijuana use? The two common misconceptions that bother me the most are that marijuana is a gateway drug leading to more dangerous substances and, on the opposite spectrum, that it’s harmless. Marijuana hasn’t provoked me to start – or even entertain the thought of – using heroin or methamphetamine. But neither is it completely without risk: it’s habitually addictive, its daily use can lead to cognitive impairment (specifically in memory retention and learning, though the deficit is small and reversible with a break), and it really shouldn’t be used by persons with certain medical standing (such as pregnant females and individuals genetically disposed to schizophrenia). How has the legalization of marijuana in several U.S. states impacted society’s perception of marijuana usage? The reform movement in the U.S. has created the opportunity for meaningful dialogue and sensible, evidence-based policies. But I think it’s worth noting that cannabis is the most widely used illicit substance in the world, with nearly 40% of people in North America admitting to have tried it at least once. So, a huge portion of society is already aware of the realities of marijuana usage – they don’t need to be convinced that it doesn’t incite violence and that it doesn’t lead to hard drugs, as they can draw from personal experience and observation. Even law enforcement officers are aware that marijuana poses less of a threat to society than alcohol. What legalization offers in terms of societal perception is the ability for users to “come out” and admit their recreation publicly, as well as the opportunity for remaining members of society to learn that prohibitionist claims have been just yellow-journalism and propaganda all along. Can you tell us a bit about the creative process for this book, from the initial idea to the published manuscript? I initially conceived the idea as I was musing over the transformation of my perception of marijuana – how remarkable and ironic it was that I went from being the kind of girl who would grow upset if her boyfriend would get high frequently, to someone who perceives the substance as an indispensable part of her life. The creative process largely involved forcing myself to write out a point-form summary when I would have a cannabis-induced epiphany. Nine out of ten times, the line would trigger my memory the next day and I’d write expanding on the topic. Once an essay was finished, I’d ignore it for a while and then edit it while high for a fresher pair of eyes and altered perspective. Then I’d edit again sober, ask for criticism from select readers, and repeat. Copious amounts of editing, marijuana and tears were involved. How do you hope readers respond to your book? I hope it makes them laugh – preferably with me more often than at me, although the latter is sort of inevitable with such a self-deprecating narrative – and that they’re encouraged to be more mindful. Are there any aspects of writing you don’t like? The way, as with any art, creative proximity can lead to critical bias. As the creator, you become emotionally attached to the text. William Faulker once said that “In writing, you must kill all your darlings” and it’s true. Every word, every punctuation is a product of your imagination, conceived in your mind and translated into reality. And with that kind of closeness, it’s so difficult and arguably impossible to properly appraise your own work for its merits and shortcomings – hence the need for honest feedback. Also, writer’s block. It can be demoralizing, depressing, and utterly soul-destroying. My next book and first novel is called Mimesis. It’ll be a coming-of-age title – with a male protagonist, strong romantic subplot and deep respect towards literary realism – which will make social commentary on celebrity culture and gender relations. But it’s only about one-tenth finished with a lot of research to conduct, so I’d be astonished if this gets finished within a year.